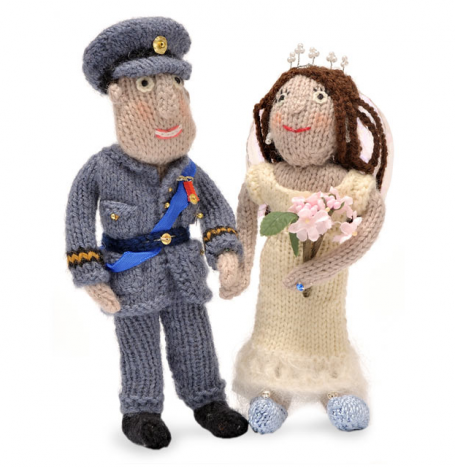 Fiona Goble’s book Knit Your Own Royal Wedding can help you do just that! This popular how-to book gives you the tools to create all of the main characters from this global event…in the comfort of your own home. If you want to add a fringe, cut them before finishing your scarf so you do not run out. Cast on 40 sts in red. Join in round, being careful not to twist the stitches. Knit in red for 3 inches, change to white and knit for 1 1/2 inches, change to blue and knit for 3 inches, change to white and knit for 1 1/2 inches. Repeat until the scarf is as long you wish, or until all the yarn is used. I plan to make mine about 7 feet long so it will wrap many times around my neck. Graft the ends closed and add fringe if you wish. When you change colours, just tie a secure knot and do not worry about weaving the ends in since it is a tube and you will not see the joins. 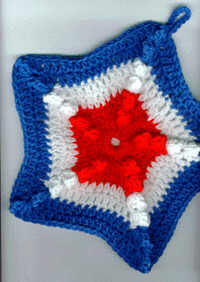 I first tried it with 3 inches each red, white, blue, but when I started again with the red beside the blue I was not happy with it, so frogged it back to insert 1 1/2 inches white in between the red and blue. 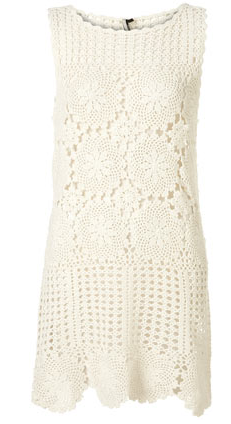 Very mindless knitting. 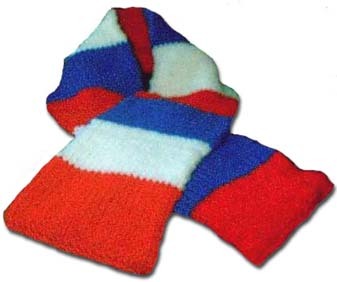 I was also thinking of using up lots of bits and colours to make a long rainbow scarf. Finished Size: 10 1/2″ in dia. Popcorn: (4 dc) in same st, pull up a lp on last dc, drop lp, insert hook in first dc made in group and in last dc made, picking up dropped lp, hook and draw lp through the first dc to complete the popcorn. Ch 6; join with a sl st in first ch to form a ring. Rnd 1) Ch 1, (sc, 3 dc in ring) 5 times; join with a sl st in first sc: 15 dc/5 sc. Rnd 3) Ch 1, sc in joining, sc in next dc, dc in next dc, (dc, ch 1, popcorn, ch 1, dc) in top of next popcorn, dc in next dc, sc in next dc; * sc in next sc, sc in next dc, dc in next dc, (dc, ch 1, popcorn, ch 1, dc) in top of next popcorn, dc in next dc, sc in next dc; rep from * around; join with a sl st in first sc dropping red and picking up white: 20 dc/15 sc/10 ch 1-sps/5 popcorns. Rnd 4) With white, ch 2 (counts as first hdc), hdc in next sc, dc in next 2 dc, (dc, ch 1, popcorn, ch 1, dc) in top of next popcorn, dc in next 2 dc, hdc in next sc; * hdc in next 2 sc, dc in next 2 dc, (dc, ch 1, popcorn, ch 1, dc) in top of next popcorn, dc in next 2 dc, hdc in next sc; rep from * around; join with a sl st to first hdc: 30 dc/15 hdc/10 ch 1-sps/5 popcorns. Rnd 5) Ch 3 (counts as first dc), dc in next 4 sts; * (dc, ch 1, popcorn, ch 1, dc) in top of next popcorn, dc in next 9 sts; rep from * around; (dc, ch 1, popcorn, ch 1, dc) in top of last popcorn, dc in last 4 sts; join with a sl st to first dc, dropping red and picking up new blue: 55 dc/10 ch 1-sps/5 popcorns. Rnd 6) With blue, ch 2, hdc in next 2 sts, dc in next 3 sts; * (2 dc, ch 1, popcorn, ch 1, 2 dc) in next popcorn, dc in next 3 sts, hdc in next 5 sts, dc in next 3 sts; rep from * around; (2 dc, ch 1, popcorn, ch 1, 2 dc) in next popcorn, dc in next 3 sts, hdc in last 2 sts; join with a sl st to first hdc: 50 dc/25 hdc/10 ch 1-sps/5 popcorns. Rnd 7) Ch 2, hdc in next 4 sts, dc in next 3 sts; * (2 dc, ch 1, popcorn, ch 1, 2 dc) in next popcorn, dc in next 3 sts, hdc in next 9 sts, dc in next 3 sts; rep from * around; (2 dc, ch 1, popcorn, ch 1, 2 dc) in next popcorn, dc in next 3 sts, hdc in last 4 sts; join with a sl st to first hdc: 50 dc/45 hdc/10 ch 1-sps/5 popcorns. Do not end off. Sl st to next popcorn; ch 12; sl st in same st. Fasten off, secure ends.